Michael and I spent 10 days on the North shore of Kauai, Hawaii and it was one of the most beautiful places I’ve ever had the fortune of visiting. So worth the long plane journey! I wanted to write up a post and share excursion details and any tips for anyone looking to travel to this gorgeous destination in the future. We chose to stay in Princeville on the North side of the island simply because that side of the island was the most visually appealing to us. We fell in love with Kauai after seeing photos of the famous Nā Pali coast so we wanted to stay close to it. The only downside to staying on the North side of the island is that it gets more rain. We got lucky and only experienced rain on two of the days of our stay but from what we heard from locals, it usually rains every day. But don’t fear – the rain doesn’t last long. It usually falls in the evenings, and sunny weather is literally a 15 minute drive South. Plus, you get rainbows! Waking up to rain isn't so bad when the result is the brightest, most beautiful rainbow you've ever seen in your life. This was right out of our patio one morning and it was so close you felt like you could touch it. If you want guaranteed sunshine, you are better off staying on the South side of the island either in Poipu or Waimea. There is a plethora of hotel options from Marriott, Sheraton and Grand Hyatt to more boutique options like Ko'a Kea. This was our home base for the trip and it was incredible. We stayed in an Oceanview Room our first couple of nights (Starwood points FTW) then moved up to a Monarch Suite which came with their signature butler service. If you are able to, I would highly recommend getting a suite at this resort, especially if you are traveling as a couple and are looking for more privacy. There are only 9 Monarch suites at the resort and they come with beautiful outdoor terrace areas and unobstructed ocean views. Well, unobstructed by humans, at least. We had chickens cruising by our door every morning. The patio of the suite was the perfect spot to watch the sun rise & set every day plus our butler brought us amazing French press Kona coffee & biscotti every morning. Your butler can also take care of dinner reservations/excursion bookings, complimentary clothing pressing daily and packing/unpacking of your luggage. Another good option that we would consider if we go back with a group of friends is to rent a house through Airbnb. 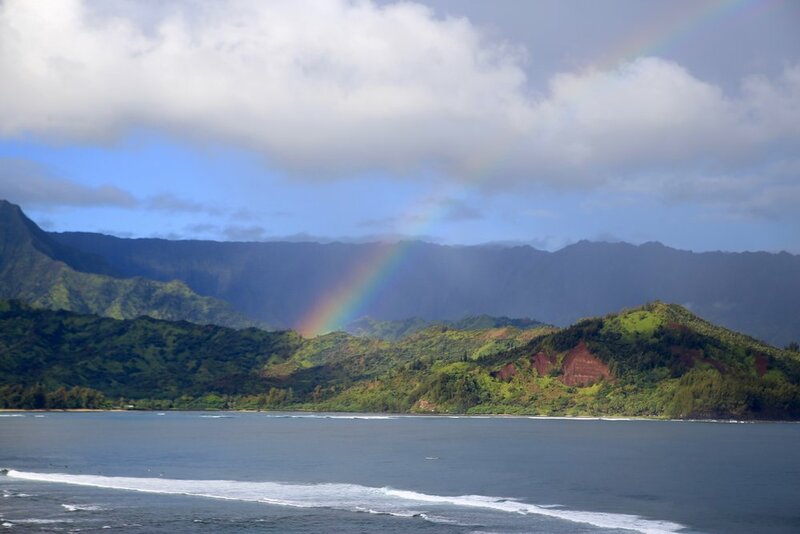 There are a ton of lovely properties available in the Princeville/Hanalei area and it’s a fun and more budget-friendly accommodation alternative, especially if you get to share it with friends! Visually it’s one of the most beautiful landscapes I have ever seen, and it literally took my breath away when we got to explore it. We were fortunate to explore this gorgeous coast 3 different ways – by land, sea and by air. I would recommend all three, to be honest. It just never got old. Our second day on the island was Michael’s birthday so we celebrated it with a morning helicopter tour of the island. It was my first time on a helicopter and it was such a fun experience. Our pilot made it really relaxing and comfortable, despite my motion sickness fears. I felt like I was on one of those dates they show on The Bachelor - and funny enough our pilot Steve had flown helicopters for the franchise before. We used Sunshine Helicopters as it’s the only company operating out of Princeville and we didn’t want to drive all the way down to the main Lihue airport. The tour spends a good amount of time taking you down the coast where you get to see these incredible ridges, waterfalls and caves from up high. The water was an electric shade of blue, the coast was studded with bright green foliage as well as with red clay so the contrast of the colours was just stunning. I couldn’t stop saying WOW out loud. Next we decided to hike the first 2 miles of the Kalalau Trail, which is the trail that takes you down the famous coast. It was a 4 mile trek roundtrip and it is studded with gorgeous lookout points, a couple of slippery stream crossings and a rocky beach that looks out to amazing cliffs and seacaves. By sea we explored the coast via catamaran (we used Na Pali Catamaran based in Hanalei) and I had a wonderful time. It’s a roughly 4 hour ride that takes you out along the coast and includes lunch and snorkeling. Michael got seasick so he wasn’t feelin’ it, but the views and up close encounters with whales, sea turtles and the incredible waterfalls dropping from the cliffs were totally worth it. Just a hop & skip away from Princeville is this cute little coastal town where we liked to have most of our meals. It’s loaded with food trucks and cute shops. The food in Hanalei was delicious and affordable; we tried to avoid eating at the hotel for the most part and preferred to just get out there and explore. Renting a car is highly recommended on the island as it will give you the most freedom and flexibility. On a calm day you can even kayak or paddleboard to Hanalei and hit up Pat’s Taqueria for lunch – it’s a cute little taco truck right on the beach, overlooking the pier. Other notable food notes from Hanalei include Bar Acuda for small plates, Postcards Cafe for a romantic dinner on their patio, Federico’s for fresh fish tacos (vegan tacos & burritos were great too) and the Wishing Well for acai bowls and smoothies. Michael was a big fan of Chicken in a Barrel which is a BBQ joint that has 2 locations on the island. If you get sick of the hotel beach or the busy beach by Hanalei Bay, Tunnels Beach nearby was perfect. We grabbed lunch from Sushi Girl (a to-go fresh sushi place at the side of the road) and enjoyed it by the beach. Kee’e Beach is also a very popular destination but get there early as the parking lot fills up by noon. Another small town nearby, Kilauea is home to a beautiful nature conservation area and a lighthouse. Stop by the Fish Market for lunch, explore the cute little shops nearby then take a long walk to the lighthouse. Makes for a beautiful afternoon. This town is at the opposite end of the island and it’s definitely more “developed” than the area we were staying in. A lot of housing developments on golf courses and a lot more resorts were on this side of the island. We stopped by Puka Dog for lunch – DELICIOUS Hawaiian-style hot dogs and home to the best veggie dog I have ever had. Would highly recommend. It’s just a casual order-at-the-counter type of spot but it’s sure to satisfy. We booked a guided tour of Allerton Garden which was one of our favourite parts of the trip. Our guide, Sam, was born and raised on the island and his dad helped build this beautiful garden. You can only do guided tours at Allerton Garden and they only happen at certain hours throughout the day - you can't explore the grounds alone. They also do sunset guided tours with dinner included, which is quite popular. We opted for a regular non-dinner tour as it had a smaller group (there were only 4 of us) and offered a more private experience. If guided tours aren’t your thing but you still want to see pretty gardens, you can do a self-guided tour of McBryde Garden instead. It’s right next door. Don’t forget to stop by Spouting Horn Park and Shipwreck Beach on your way back to your hotel. Unfortunately we did not make it to this town during our stay (will get to it next time!) but if you are an avid hiker, you have a myriad of trails to choose from in the canyon nearby. On one of our last days we booked a jungle adventure tour with Princeville Ranch Adventures and even though we were rained on the entire time, it was awesome! It’s a guided tour that takes you hiking, kayaking and zip-lining through the jungle on the North Shore and it was so much fun. They also have horseback riding and ATV tours available on their massive ranch. I absolutely loved the kayaking part though and would highly recommend it. The water was super calm and it was so serene just making our way through the twists and turns of the stream. All in all, Kauai was the perfect destination for us. It’s incredibly laid back (I did not pack any high heels), and a must if you like the outdoors. There are tons of activities available for a myriad of interests (there’s a chocolate farm tour that was on my list to try but we did not have time to make it), the food is delicious and the landscape is breathtakingly beautiful. It’s the perfect place to unwind and recharge your batteries. We can’t wait to go back!